Need more cleaning powder for your SonicBrite™ system? If you see a photo of a SQUARE bottle of SonicBrite on another website, then they are selling old expired products! 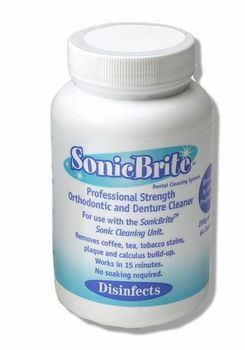 At DentaKit, rest assured that we carry factory-fresh SonicBrite powder. The Sonic Brite system is a safe yet powerful cleaner for retainers and all types of removable dental appliances such as: plastic and wire Hawley retainers and appliances, mouthguards, nightguards, bruxism appliances, and TMJ splints. (Please note: it is NOT recommended for Invisalign aligners or clear Essix retainers, as it sometimes turns those devices cloudy). This cleaner is gentle enough to get all the thick white build-up off of retainers, leaving them clean as new; yet tough enough to clean even the most stubborn coffee and tea stains off of dentures or partials! It helps keep all types of dental appliances bright, clean, and fresh. Don't be fooled by low price sellers on Amazon and eBay who carry expired old products -- our SonicBrite products are always factory fresh from the manufacturer! Each bottle 7-ounce of SonicBrite Professional Strength Cleaner is enough for 64 cleanings. It's an economical and smart way to keep your dental appliance clean and odor-free year-round! The Sonic Brite powder is unflavored and unscented - great for kids and adults alike! Please note that the cleaning powder is specially designed to work with the sonic bath (sold as part of the SonicBrite kit). Sonic Brite is not recommended for appliances containing gold. Do not soak appliances containing metal components for more than 15 minutes per cleaning. Not recommended for appliances containing metal solder, appliances containing gold, or clear appliances such as Invisalign or Essix retainers. Kills 99.9% of germs in one 15-minute use. Please note that the cleaning powder is specially designed to work with the sonic bath (sold as part of the SonicBrite kit). The powder will not do the same effective job in cleaning your appliance without the vibrations from the sonic bath that comes with the SonicBrite kit. You get one 7-ounce (200g) bottle of cleaning powder, which is enough for 64 cleanings. Strong enough for dentures, yet gentle enough for most types of retainers. Will not turn retainers yellow. We do not have a list of ingredients, but if you are concerned about an allergy, please contact us. Sonic Brite is not recommended for: appliances containing gold, appliances containing metal solder, Invisalign aligners, or clear Essix retainers (can turn them cloudy). Do not soak appliances containing metal components for more than15 minutes per cleaning. SonicBrite is a high-quality dental appliance cleaner which is strong enough for dentures, yet gentle enough for most types of retainers and mouthguards. It is especially good at removing stubborn white plaque buildup after several uses. Can you use SonicBrite on the small cordless sonic cleaner that you sell (Item #: DK-RBSC1)? Yes, you can use the Cordless Sonic Cleaner with the SonicBrite powder (although the sonic bath that comes with the SonicBrite Kit is nicer because it automatically turns itself off after 15 minutes). We realize that the SonicBrite Kit is currently out of stock. We expect to have the it back in stock by the end of 2018 or early 2019. When will SonicBrite Powder be back in stock? Can you soak your retainer in SonicBrite for more than 20 minutes? If you do, what will happen? We have found that if your retainer does not contain metal solder or gold, soaking longer than 15 to 20 minutes should be fine in most cases and should not harm your oral appliance, even if you leave it soaking overnight. (Most soaking solutions will dissolve metal solder and discolor gold after a period of time). If you're not sure whether your appliance contains metal solder or gold, please ask your dentist or orthodontist. With that said, please be aware that the official manufacturer's instructions recommend that you do not soak your oral appliance longer than 15 to 20 minutes. When in doubt, we suggest that you defer to the manufacturer's instructions. thought i would get a new spoon ?? Merchant Response:In the words of the child from The Matrix: "There is no spoon." The makers of SonicBrite discontinued including a spoon with the product many years ago. I like the SonicBrite the best of all the cleaners. This is a great product. I use it as directed and have been very happy with it. My experience with SonicBrite professional cleaner was wonderful. It is an excellent quality product. I use it once a week and tablets the other days. This cleans better than anything else. THIS IS A VERY EFFECTIVE PRODUCT FOR REMOVING STAINS ON FIXTURES. HAVE TRIED OTHER MATERIALS BUT THIS IS BY FAR THE BEST FROM SONICBRITE. The product works really well. Be careful about getting it on your clothes or on colored towels when you wipe out the sink or the Ultra-sonic device. It will bleach out spots on colored fabrics.